Speaker Paul Ryan (R-Wis.) told black lawmakers Wednesday that he supports new voting rights protections they've championed, but said he won't bypass a committee chairman to move legislation, according to a Democrat who attended the gathering. "He said it right in front of everybody — he said he supports the [Jim] Sensenbrenner bill," Rep. Emanuel Cleaver (D-Mo. ), former chairman of the Congressional Black Caucus (CBC), said after Ryan met with the group on Capitol Hill. "So somebody was saying, 'Well, why don't you go tell your committee chair to do it?' " Cleaver added. "And he said, … 'Look, I can't do that.' "
But Sensenbrenner's proposal does not have the backing of the current Judiciary chairman, Rep. Bob Goodlatte (R-Va.), who maintains the Supreme Court left ample protections in the VRA, thereby making congressional action unnecessary. Ryan ascended to the speakership last fall following the resignation of former-Rep. John Boehner (R-Ohio), who was nudged out by conservatives who accused him of hoarding power at the expense of the committees. 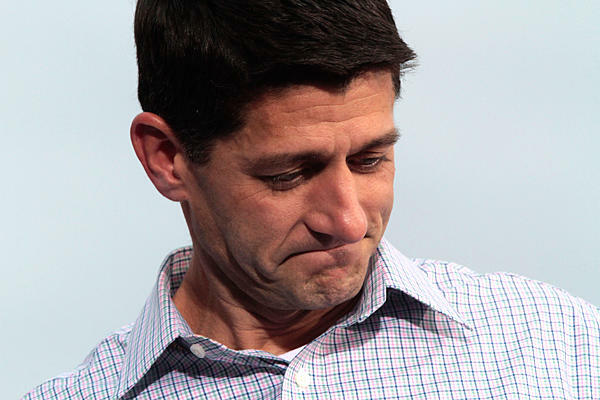 Ryan, a former chairman of both the Budget and Ways and Means panels, has vowed to return to a bottom-up approach that transfers power back to rank-and-file members. Ryan told the CBC Wednesday that any voting rights legislation must move by that bottom-up process, Cleaver said. "He said, 'I told my own conference I'm not going to do it, so I'm not going to come up here and tell you anything differently. … I want it to be the product of the committee,' " Cleaver said. Ah, so Ryan would love to help, but he left his authority in his other pants. Something tells me, though, that if the bill was to cut Social Security, Medicare, Obamacare or any other "entitlement" program, he'd waste no time in pressuring whoever he had to to make sure that the bill passed as fast as possible. But when it comes to actually helping people - especially poor people or minorities - well, his hands are tied. He is only the Speaker of the House, after all.